Summary: In “Alone Together,” MIT technology and society professor Sherry Turkle explores the power of our new tools and toys to dramatically alter our social lives. It’s a nuanced exploration of what we are looking for–and sacrificing–in a world of electronic companions and social networking tools, and an argument that, despite the hand-waving of today’s self-described prophets of the future, it will be the next generation who will chart the path between isolation and connectivity. Professor Turkle is the author of Psychoanalytic Politics: Jacques Lacan and Freud’s French Revolution (Basic Books, 1978; MIT Press paper, 1981; second revised edition, Guilford Press, 1992);The Second Self: Computers and the Human Spirit (Simon and Schuster, 1984; Touchstone paper, 1985; second revised edition, MIT Press, 2005); Life on the Screen: Identity in the Age of the Internet(Simon and Schuster, 1995; Touchstone paper, 1997); and Simulation and Its Discontents (MIT Press, 2009). She is the editor of three books about things and thinking, all published by the MIT Press:Evocative Objects: Things We Think With (2007); Falling for Science: Objects in Mind (2008); andThe Inner History of Devices (2008). 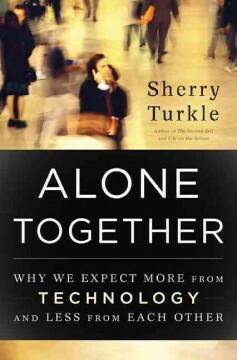 Professor Turkle’s most recent book is Alone Together: Why We Expect More from Technology and Less from Each Other, published by Basic Books in January 2011. For media inquiries, go to:http://www.sternsourcebook.com/sherryturkle.php. Professor Turkle writes on the “subjective side” of people’s relationships with technology, especially computers. She is an expert on mobile technology, social networking, and sociable robotics. Profiles of Professor Turkle have appeared in such publications as The New York Times, Scientific American, andWired Magazine. She has been named “woman of the year” by Ms. Magazine and among the “forty under forty” who are changing the nation by Esquire Magazine. She is a featured media commentator on the social and psychological effects of technology for CBS, NBC, ABC, CNN, the BBC, and NPR, including appearances on such programs as Nightline, Frontline, 20/20, and The Colbert Report.